The Green New Deal is uniting greens and progressives in the US and the UK. Today the movement enters the halls of power. On both sides of the Atlantic, a powerful coalition is forming, as the ‘radical’ left puts the environment front and centre. 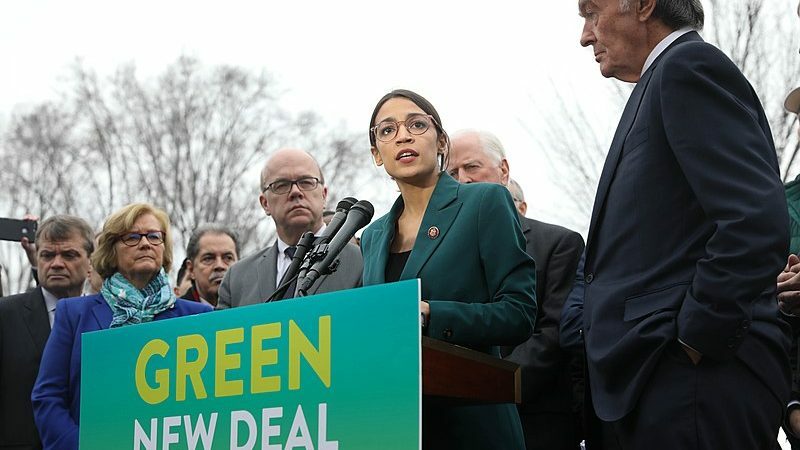 The idea of a Green New Deal has soared to prominence in recent months in the US. Left-wing senator Alexandria Ocasio-Cortez has reinvigorated an idea that draws on FDR’s New Deal of the 1930s – which used massive investment in jobs and infrastructure to pull the US out of the Great Depression. The call – for huge investment in green jobs and infrastructure – has succeeded in uniting the left around a strategy to tackle climate change and inequality at the same time. It’s not new: 10 years ago, now Green MP Caroline Lucas co-founded the UK’s Green New Deal Group to call for exactly that. Since then, the party has shifted proudly to the left – understanding that a bold climate change policy, if it’s to succeed, has to improve people’s lives and give people hope. Yet that vision has so far broadly eluded the Labour Party. Ecologists’ refrain ‘there’s no jobs on a dead planet’ has in the past been accompanied by criticism of Labour’s ‘pro-growth’ agenda. But while there have always been tensions between the traditional left and environmentalists, something is changing. Socialists can no longer be accused of side-lining climate change. “We can do even better in the UK…Labour transformed the country after 1945, building the NHS and a welfare state derided by naysayers as impossible. Now, with a movement of half a million members, it can end a system rigged in favour of the City and build a new society of social and environmental justice,” Satow writes. Politicians are already listening. Today the Green New Deal reaches the halls of power. In the US, the Senate is scheduled to take up a procedural motion on left-wing Democrats’ plans (ironically, the move is led by Republicans leading an early vote to ‘out’ Democrats as New Dealers). And in Parliament, Labour’s Shadow Treasury Minister Clive Lewis and Green Party MP Caroline Lucas will table a Private Members’ Bill that (if passed) would force the government to enact a Green New Deal. The ‘Decarbonisation and Economic Strategy Bill’ would place duties on ministers to introduce a radical 10-year strategy for public investment designed to decarbonise the economy and eradicate inequality. It would legally require ministers to empower communities and workers to transition from high-carbon to low and zero-carbon industries, introduce stricter environmental regulations and protect and restore natural habitats. This is the first time a Bill designed to enact a Green New Deal has come before Parliament – and, encouragingly – it is backed by Labour’s Shadow Treasury Minister for Sustainable Economics, Clive Lewis. (The Tories are, of course, very unlikely to get behind it). There are a lot of factors at play here. The cross-party move comes in the wake of this month’s global school strikes, which saw more than 50,000 young people join protests across the UK calling for action to tackle climate breakdown. Recent months have seen the growth of ‘Extinction Rebellion’ – a national direct action group bringing a new generation into climate activism. It is driven a sense that we can’t tackle the current crisis within a stale, centrist politics. “We need to do what is required of us – not simply what is seen as politically possible,” says Lucas. The Green New Deal will vary from the US to England and Wales. But whatever it looks like, wherever it appears, it does something powerful: it unites the radical left and greens. Today this movement reaches the halls of power. Perhaps the most dangerous misconception about the climate crisis is that we have to “lower” our emissions. Because that is far from enough. Our emissions have to stop if we are to stay below 1,5/2°C warming. That rules out most of today’s politics. Including airport expansions.. I cant work out just what significant measures the government are following to combat climate change. They seem rather keen to encourage fracking, no interest in the fuel escalator and they have virtually killed off domestic solar panel applications. Not much progress since Cameron’s infamous “Green Crap” remark. The government are trying to dump the control of vehicle pollution on councils but not provided much-needed finance and statutory support. One thing for sure we can’t continue with ‘business as usual’.